Four years ago, my first post was peach cardamom crisp, so I decided to recreate it today in tribute to four amazing years of blogging my baking. 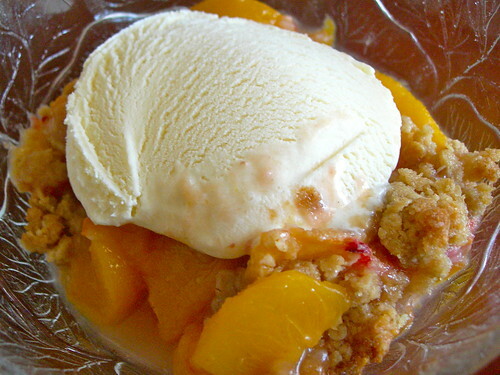 I made a smaller version with fresh SC peaches, and kind of threw the ingredients together for the crisp part, but it was a nice reminder of where everything started. I have been collecting cookbooks as souvenirs for at least ten years now, and it can be a great way to revisit a place in your kitchen. In 2000, Nathaniel and I were driving across the country around this time, from Oregon to Indiana, so that I could go to graduate school at Indiana University. We stopped at a bed and breakfast in Prairie City, IA. I remember it was out in the middle of nowhere, that the rooms were decorated with quilts and painted saws, and that the owners brought up a lot of morbid topics over breakfast. We also went to the Iowa State Fair because that is like "THE" state fair, but it was the hottest weather we had yet to experience as wimpy Northwesterners, and we didn't last long. Before we left the house, we purchased a cookbook called "Sampling Iowa Treasures Cookbook," which professes to include recipes and trivia from bed and breakfasts in Iowa. I actually find it to be one of my staple breakfast cookbooks, because who knows hearty breakfast fare more than Midwestern bed and breakfast cooks? I picked this recipe because it only made one round cake pan of breakfast cake, and the idea of adding oatmeal intrigued me. I only had about a cup of fresh blueberries from the garden and picked the recipe because it only called for that. The cake was okay. I am uncertain about the oatmeal because while it did add a nice chewy texture, I'm not sure that is what I expected when I took a bite. Just a simple, quick breakfast cake letting the blueberries shine. Grease 8" round pan and set aside. In a medium mixing bowl, stir together flour, rolled oats, sugar, baking powder, and salt. In a small mixing bowl, stir together egg, milk, and oil. Add all at once to dry mixture. Stir until just moistened (batter should be lumpy). Fold in blueberries. Spoon batter into the prepared baking pan. Bake coffee cake at 400 F for 20-25 minutes, or until cake is golden and a toothpick inserted near center comes out clean. Cool in pan on a wire rack for 5-10 minutes. Icing: In a small bowl, stir together sifted powdered sugar and enough milk to make icing of drizzling consistency. Serve warm. Serves eight. *- I used buttermilk because I had a bunch on hand. 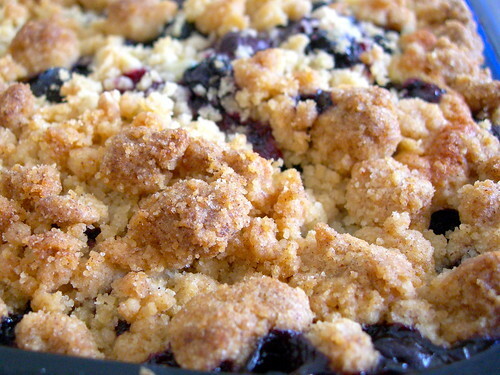 ** - I used fresh berries, but tossed them with a bit of flour to try to get them not to sink to the bottom. The picture only shows them on the bottom, but they were at varying levels throughout the cake. 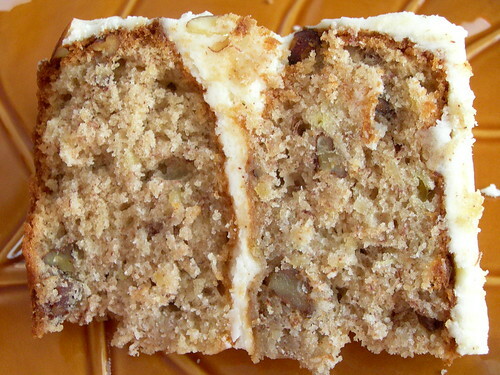 I had hummingbird cake in my head, although I hadn't made one in years. I did a Google search and Art Smith's version kept coming up repeatedly, so even though it was on Oprah.com and I have a love-hate relationship with her, she did bring me the best mac & cheese recipe ever. Hoping against hope that Oprah knows food, and so should Art Smith after seeing him on Top Chef Masters, I went with it. I'm so glad I did. This cake was light and airy and flavorful and I will definitely make it again. Next time around I will probably bake the cake in three layers because that would add to the delicacy, and these layers were THICK. It also made it harder to ice; I'm pretty sure half my icing went between just too layers. I should have evened them out but just went for the rustic feel. One thing that is hard to plan for is knowing how many bananas you'll need for 2 cups of bananas. I had four regular bananas and it wasn't quite 2 cups, so bring home at least 5! 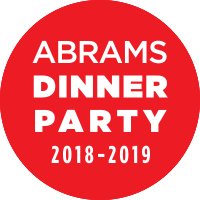 Throughout the summer at the library where I work, we have weekly events hosted by different departments. As the only adult in the music library, I got to take one week on my own. I live in the south, and it is hot and humid here, so that ruled out anything frozen or chocolate. Back in January, I pledged to make more recipes with seasonal ingredients, and blueberries have been in peak season around here. 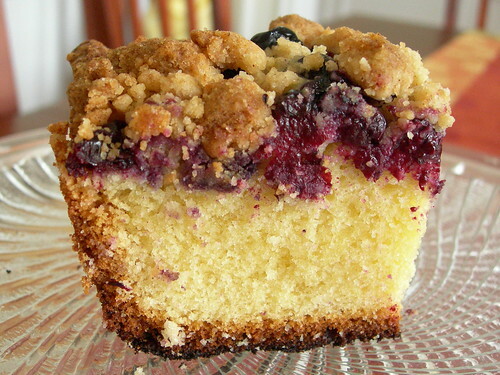 Perusing the cookbooks on my shelf, I found several recipes for blueberry crumb cake, and decided to pit Dorie Greenspan's and Nick Malgieri's recipes against each other. Nick Malgieri's recipe comes from The Modern Baker. 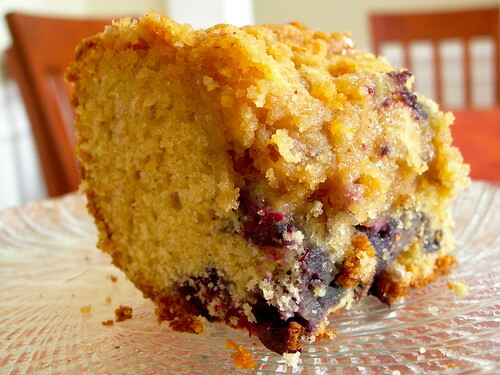 It is a rich cake with a topping of blueberries and crumblies. You can tell I burned the bottom a bit - I had to bake it ten extra minutes to get the tester to come out clean. I think this is partially because the blueberries are layered on top instead of being throughout the cake, creating this sort of moisture density that the batter on top didn't deal with very well. 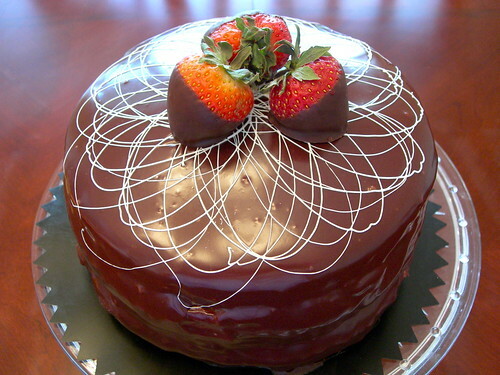 The visuals of Nick's cake are impressive, though, because you can see the berries clearly without it being cut into. Dorie's recipe, from Baking: From My Home to Yours, had a little bit of cinnamon in the batter as well as the addition of nuts in the crumb mixture. 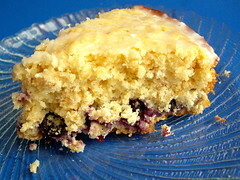 The berries get mixed into the batter, so they are found throughout the cake. I doubled the recipe so I could bring two of the same size to work. I mixed up a big batch of iced coffee concentrate, because to me a slice of blueberry crumb cake and a glass of iced coffee sounded perfect on a humid southern afternoon. I was hoping for a thunderstorm but it didn't happen until later. So whose cuisine reigned supreme? Among the library staff and faculty, there wasn't a clear winner, and I saw people taking seconds from both pans. To my taste, Dorie edged Nick out in the end because there was just more flavor going on, and the cake texture was more to my liking. I had a lot of people express to me that they hoped I didn't have to make my own birthday cake, but these people are always treated to a look. A look that says, "I'm a baker, of COURSE I make my own birthday cake." This year I decided it needed to be a cake with so many different chocolate elements that it could only be called a diva chocolate cake. I think the only part that I imagined that didn't end up on it were chocolate curls, but I either ran out of time or wasn't sure they'd hold up well in the humidity and then in the fridge. I pulled different elements for this cake from different cookbooks, then added a few twists of my own. The cake layers are based on the cake from the Devil's Food White-Out Cake in Baking From My Home to Yours by Dorie Greenspan, although I used semisweet chocolate for the melted and added a bit of Grand Marnier to the batter. 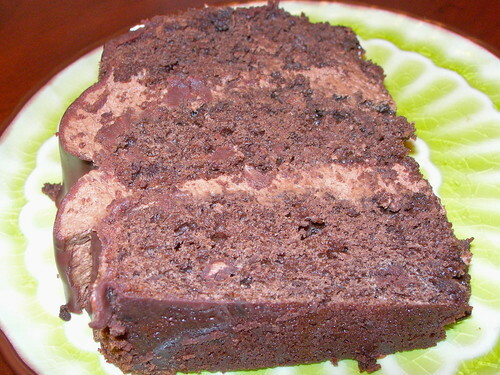 I loved her description of it, saying that it is good room temperature but that it gets fudgy when it is cold, so I thought it would be a great pairing with mousse between the layers, since it would spend some time in the fridge. The mousse is based on a recipe in A Passion for Baking, which has really become my go-to cookbook. But I didn't just want straight chocolate. Nathaniel and I were trying to say what we would pick for our favorite cold dessert ever, after watching the new show "The Best Thing I Ever Ate" on Food Network. We agreed that the milkshakes that we used to get at Coffee People, a northwestern coffee shop that no longer exists in the version that made ice cream and milkshakes to match its drinks. I used to order cappuccino borgia, which was mocha and orange and I've never been able to duplicate it, believe me, I've tried. Their velvet hammer was a very close second. If you went there during that era, I'm sure you know what I mean. But I decided to mirror the flavors of the cappuccino borgia milkshake in this mousse, by adding instant espresso and more Grand Marnier to the chocolate mixture before folding in the whipped cream. After everything chilled I poured over a ganache and did a simple white chocolate design on top, topping everything with three chocolate covered strawberries. We had slices for my birthday, but I cut too generously, and neither of us could finish. This is a tiny-slice tasting cake, for certain. And it tastes even better after spending the night in the fridge!